Just a year into things, 60000 hits and counting! 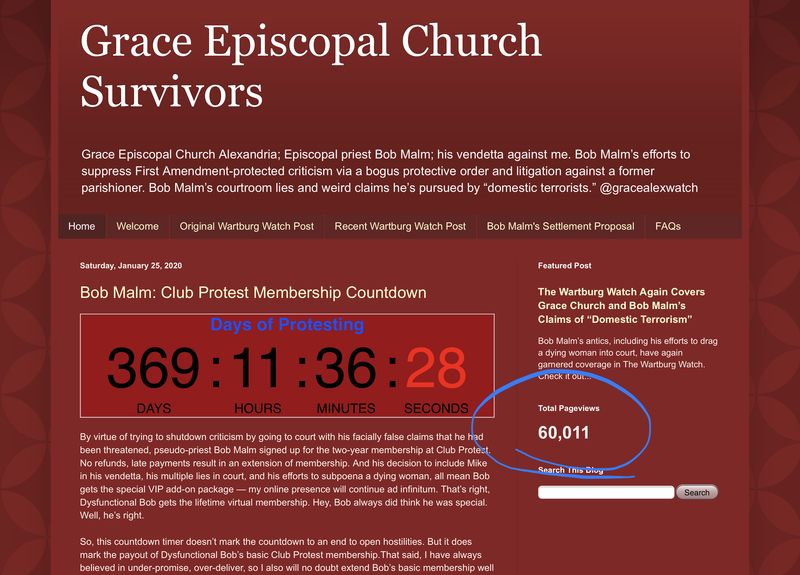 Visit http://www.bobmalm.com to learn about Episcopal priest Bob Malm’s weird claims that he’s threatened by “domestic terrorists,” his efforts to drag a dying woman into court, and his various lies in court. Re: BobMalm.com Breaks 60,000 Hits! Speaking of, how’s your shrink working out for you? But then, with more than 100 pledging units gone, people are sending a clear message what they think of Bob’s conduct. People simply aren’t interested in a priest who lies, let alone paying $200,000 a year for the privilege. Will be interesting to see how Bob plans to pay for the HVAC replacement. Eric, we did good job making traffic to your site with Russian bots, yes? You pay us soon, right? Send the bill to Bob Malm. He loves my blog!